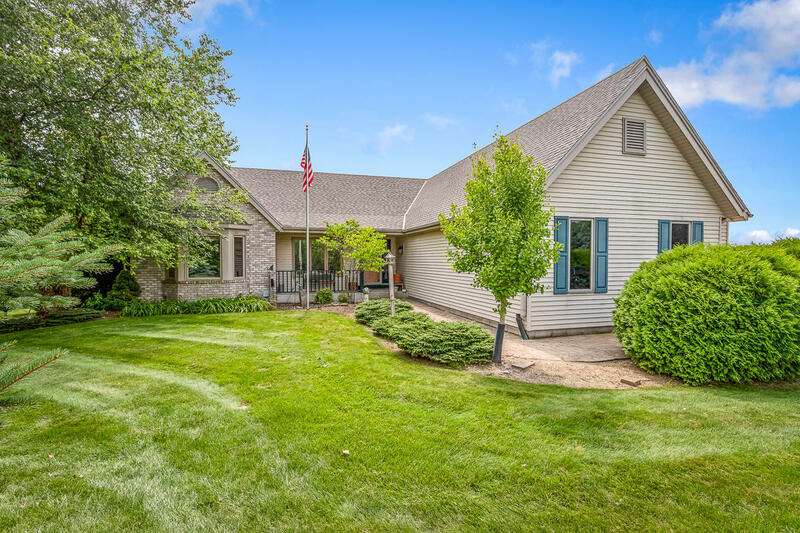 Built into a picturesque setting, this amazing open concept ranch with major updates is situated on a secluded 1.5 acre mature lot in the Village of North Prairie. Plenty of cabinetry and counters in the spacious kitchen that opens up to the living area with a gas fireplace as the focal point. Hardwood flooring throughout most of the main floor. Amazing views from every room, wrap around deck, finished walk-out lower level with a family room, 4th bedroom and 3rd bath including 2 zone heating/cooling. Main floor laundry, central vac, in ground sprinkler system, 3.5 car attached garage and additional detached garage. Many updates include: roof, windows, doors and deck. Plenty of storage, all appliances included. Enjoy the peaceful surroundings in your new quality home!